I live in Dublin, Ireland with my husband, two children and dog, Barney. Because Barney likes to pee indoors (ugh…SO smelly! ), he became the inspiration for the character Andrew. I love fantasy, plot twists and humour. ‘Bridget in Werewolf Rehab’ – Book 1 is packed full of that. My second book, ‘Bridget the Werewolf and the Seven Crystals’ – Book 2 is an adventure quest set seven locations around the world. I go wobbly bonkers for werewolves and would secretly love to be one! I also love when girls take charge of their destiny like Bridget does. My favourite book growing up was ‘The Lion, The Witch and the Wardrobe,’ but I also loved non-fantasy books – Mallory Towers, St Clares, Nancy Drew, Famous Five, Secret Seven, Black Beauty, Anne of Green Gables – I loved losing hours of time reading. I’m passionate about children reading and writing their own books and as part of the Trinity College Bookmarks Programmes in 2014 and 2015, I’ve been lucky enough to help hundreds of girls and boys write their own stories. 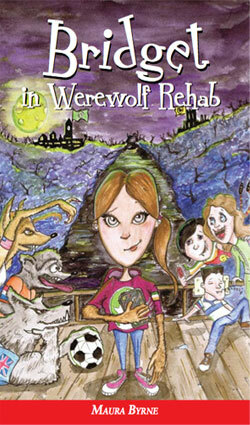 ‘Bridget in Werewolf Rehab‘ is the first book in the ‘Bridget’ trilogy. Book 2 ‘Bridget and the Seven Crystals’ has been launched in June 2017.